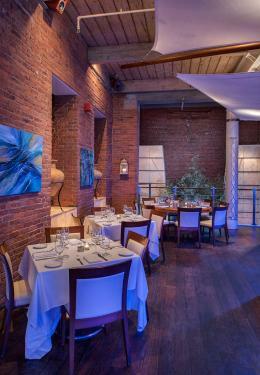 Thalassa Restaurant makes its location in a historic building located in the heart of Tribeca. From the moment you enter the bar and lounge area you realize that the word "Thalassa" in Greek means the sea. Blue lighting and elegant sails suggest that you are sailing the Greek Islands. Flowing curtains over original exposed brick remind you of the sandy shores of warm beaches. Urns from Tripoli once used to store olives and olive oil ages ago now overflow with fresh flowers as they sit atop hand-made Iroko wooden tables from Mykonos. Guitarist Wednesdays: 7pm-10pm & Sundays: 5pm-10pm.